The clear-up operation after the demolition of Greyfriars Bus Station in Northampton continued through the night on Sunday. Demolition experts brought the building down in six seconds using more than 2,000 explosive charges in what was one of the most dramatic events to have been seen in the town’s history. Northampton Borough Council estimates the site will take until June to clear and have pledged that it will be redeveloped in the future. The council has already revealed that the site will include an area for National Express coaches. The demolition was watched by thousands of people on the Chronicle & Echo’s website. It happened just after 9.30am. Debris from the demolition spilled across the roads surrounding the bus station and demolition crews worked hard to clear the roads as quickly as possible. Last night, Northampton Borough Council said Greyfriars, Lady’s Lane and Abington Street in Northampton were still shut as crews worked to clear debris from the blowdown. A spokeswoman for NBC said: “Good progress was made in clearing both roads but there is some minor surface damage to Greyfriars and Lady’s Lane and work to repair the carriageway will take place early on Monday morning. 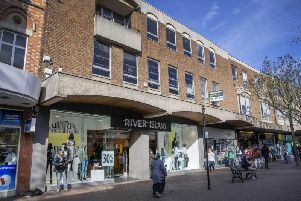 “The Grosvenor Centre and Abington Street will be able to trade as normal and arrangements have been made for businesses to receive deliveries. “The Grosvenor Centre car park will remain closed until Greyfriars and Lady’s Lane are repaired but the Mayorhold car park, Victoria Street car park and Newlands car park will all open as usual. “North Gate bus station will open as normal and buses will follow the slight diversion route they took on Sunday. “The roads will be open to traffic as soon as the repairs are complete and we will keep you updated during the day,” the spokeswoman added. Councillor Mackintosh, who will go down in history as the man who led the destruction of Greyfriars Bus Station, added that he was personally pleased to see the former bus station gone. He said: “I have many memories travelling through there myself as a child, and it has dominated the skyline since before I was born.